S&S Seating has been contracted by the Omaha Zoo Foundation to remove and distribute the memorabilia stadium seats from Rosenblatt Stadium. Omaha, NE - June 25th, 2011 – S&S Seating, today announced that they have been contracted by the Omaha Zoo Foundation to remove and distribute the Rosenblatt Stadium seat pairs being sold to fans and collectors. Rosenblatt Stadium opened in 1948 and has been host to several minor league baseball teams, most recently the Omaha Royals, which played at Rosenblatt from 1969-2010. Most notably, Rosenblatt Stadium was home to the College World Series® (CWS) for 60 years. The final CWS game at Rosenblatt was played on June 29, 2010. Seat pairs are available for purchase from the Omaha Zoo Foundation. Season ticket holders can purchase their specific seats now, with general public sales beginning in July 2011. The limited inventory of seats will be sold on a first-come, first-served basis and the seats are being sold in the 'as-is' unrefurbished condition that they are removed from the stadium. For purchase questions and/or further details on memorabilia sales, please contact the Omaha Zoo Foundation. S&S Seating has been family owned and operated since 1996. In addition to memorabilia seat removal and distribution, S&S Seating also offers refurbished used stadium seats to organizations looking to upgrade their facilities. Additional information on S&S Seating services can be found online at www.stadiumseating.net . The Omaha Zoo Foundation, a Nebraska 501 (c) 3 non-profit organization, was established in 1984 and supports the mission, research and programs benefitting Omaha’s Henry Doorly Zoo. Through the use of living exhibits of animals and plants, Omaha’s Zoo is dedicated to the preservation of the earth’s priceless biodiversity. It is our commitment to support, preserve and build upon this legacy for future generations. More information can be found at www.omahazoofoundation.org. The Omaha Zoo Foundation acquired ownership of Rosenblatt Stadium for the redevelopment of the site to grow and improve the nationally acclaimed zoo. Omaha’s Henry Doorly Zoo will honor and immortalize the legacy of Rosenblatt through The Infield at the Zoo Legacy Project. For decades, Rosenblatt Stadium has served as both the iconic and physical manifestation of baseball in the Omaha community. 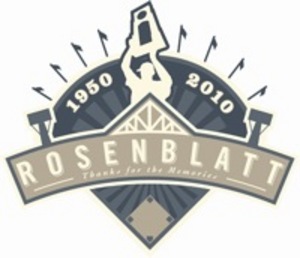 The history and fond memories of Rosenblatt will be commemorated as “The Infield at the Zoo.” It not only cements the past, but also creates a distinct connection with the future. Key features include the preservation of the original location of home plate, re-creation of the base paths, re-use of the original stadium seats, preservation of key site lines within the original stadium, and integration of the dugouts.